While we generally preach to bring as few beauty items as possible, because you’re beautiful without them, we understand there is a time and a place for getting a little bit dressed up, and for just maintaining the natural order of our bodies (think lotions). For example, you might be attending a friend’s wedding overseas and would like to be a bit dazzled up. Or, you might be attending a conference in the middle of a bigger trip (a trip where getting dressed up is otherwise not required) and need to have your fresh face on. Multiple dips in the sea can also leave your skin feeling dry and damaged, requiring some extra lotion and after sun care. 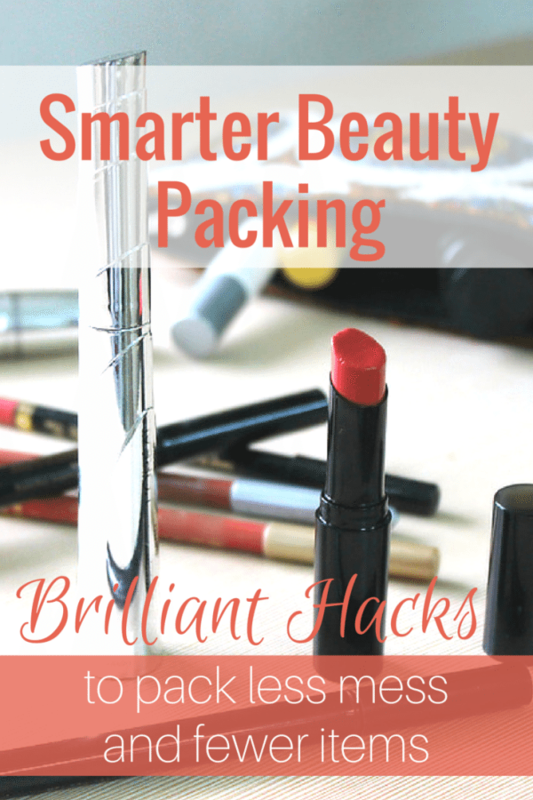 With this in mind, I have decided to list out some smarter beauty packing hacks. These tactics include multipurpose items and just plain ways to get around packing your entire beauty kit for a trip where you may only need to use it once or twice. >> You might also be interested in this previous make-up containers and hacks post. We’re not shy to the concept of using BB cream around these parts, and we’ve talked about it many times before. BB cream is the ultimate beauty item as it takes the place of a base, moisturizer and basic sunblock in one. Of course, there are going to be destinations which require you to bring a more extensive sunblock (like Australia! ), but for casual travel, this should do. Ditch facial sunscreen, base and daytime moisturizing separates. Instead of a separate eyeshadow, blush, and lip tint, why not bring one color of powder that can be dusted on all three for extra glow? When it comes to lip tint, simply mix a bit of powder with a bit of your normal balm (whether that’s Chapstick, paw paw, or gloss), and apply. I don’t know about you, but for me a little mascara and eyeliner can do wonders for the way I look and feel. But, I only tend to wear these on occasion when I travel, and I hate that it requires me to bring an extra eye makeup removal product in addition to these two small items. Not only that, but I find mascara really hard to remove, and I’m always losing eyelashes in the process. Recently, however, I’ve found a better way. Eyelash tinting is my new best friend and my new favorite thing. The color tends to last several weeks, which is not bad for a 15 minute investment, so if I do this before leaving on my trip I can easily forgo packing mascara altogether. At the same place where I get my eyelashes tinted, there is also the option of getting your eyelashes permed or your eyebrows tinted. The former adds a dash of curl to your lashes, and the latter is perfect for accentuating your eyebrows when you might normally take time using a pencil to do the same. I haven’t done either of these, yet, but they also come with a time limit so will best work for shorter trips, or trips where you have the ability to maintain the practice at your destination. Ditch the eyelash curler and the eyebrow pencil. We already mentioned packing one color of makeup powder that can be used as your blush, your eyeshadow, and your lip color, so if you do that then your eyes are pretty much covered. Still, we wanted to give you other options to bringing breakable eyeshadow palettes. Single-use instant eyeshadow sheets come with multiple colors of eyeshadow strategically placed and ready to go. All you have to do is press and rub onto your eyelid, remove, and blend to your liking. We imagine these to be a great addition to your travel beauty kit when you only need to wear makeup on special occasions, and they’re much more packable as well. Ditch the breakable eyeshadow palettes. No one wants to be a stinky traveler. No one wants to have perfume spill or leak all over their luggage either. To solve that problem, we highly recommend packing solid perfume instead. We’ve talked about several brands on our blog thus far, but we are biased towards Aroamas, of course. Ditch the spilling, leaking perfume bottles. Bee Bar Solid Lotion – See more on Amazon. Another solid that can save you hassle when packing is solid lotion, which can come in bar or stick form. Solid lotions tend to work better for trouble areas such as elbows and hands and feet. Another plus is that you can often use solid lotion as a lip balm in a pinch. Just make sure the solid lotion is fragrance free, or contains lip-safe fragrance. I usually just DIY my solid lotion as I have all the tools at my convenience from my Aroamas business. Ditch the leaky liquid lotions. Nail polish just does not travel. At least not in your carry-on. And since we often promote traveling with carry-on only, it’s hard to recommend packing a nail polish. If you really feel the need to glitz up your nails, you could try nail strips. Instead of packing a messy liquid bottle of polish, you can pack non-spilling polish strips that often come in crazy designs that would be hard to replicate with traditional polish. The efficacy of these are questionable, however, so I recommend reading reviews and testing how some brands perform before relying on them on the road. Or, there’s always the chance to get your nails done abroad, which can be a very interesting cultural experience at the same time. Ditch the bottles of polish. Lip options for female travelers. We’ve already touched on a couple of alternatives for lips in the previous sections. Instead of lipstick, you could use blush and lip balm to make color. Or, you can use a solid lotion as a lip balm when the weather is really dry. Other women like to travel with paw paw ointment which can be use on the lips or as a body lotion for rough spots (and so much more). Ditch the lipsticks, or ditch a separate lip balm altogether. If you’re a slave to your hair, you might have trouble with this one, but your travel life will be so much better if you can learn to embrace your natural hair! If you love your hair dryer, don’t worry as you’ll be able to find a hair dryer in most hotels and even some hostels (you just might have to ask for it). If you’re a straightener type of gal, either go for a mini travel version, or invest in a good brush that you can use with a hair dryer to give it a similar feel. Now for hair product, like shampoo and conditioner, you’ll want to fill some reusable travel bottles with only what you need (and you can top off as you travel with product you buy locally). To use even less product, train your hair to go a few days between washing if you can. It’s not always easy, but you might even find that your hair suffers less from dryness and split ends after the conversion. And, of course, look into solids! We can’t stress it enough. There are several solid shampoo bars on the market from Lush to more natural soap-like bars that mean you travel with less liquids. Ditch the hair appliances, and ditch the extra liquid products. We would absolutely love to hear if you have any other suggestions, OR if you have tried any of the above mentioned hacks to achieve smarter beauty packing. Shampoo bars! No leaky shampoo bottles that fill up precious 3-1-1 baggie space, and as an added bonus, they can be used from head to toe and usually make great shaving soaps, too. I can’t detangle my hair without conditioner, so I also travel with a solid conditioner bar (which also doubles as shaving cream for more sensitive skin). What brand of shampoo bar do you use? I love testing new stuff, so I have used a lot of different brands in the last couple of years. My favorites (the ones I always gravitate back to) are Sorbet Solid Cosmetics, Fortune Cookie Soap, and Lush. I use Chagrin Valley shampoo bars. They’re organic and sufate free, so good for curly hair. I hear really good things about this company. I love JR LIgget’s bar shampoo with Coconut oil. I washed my extremely curly hair with the same bar for five weeks living out of a backpack in Ghana and Mozambique last year, and still had some to spare! Like one of the other commenters, I can’t live without my styling products so that’s where my liquids go. I use a handmade goats’ milk shampoo bar from EllaColdi – real, whole goats’ milk, not the powdered stuff used in most soaps – which leaves my hair in such good condition that even my fine, cobweb-like hair doesn’t need a detangler. I have never seen those instant eyeshadow sheets before – how interesting! It’s amazing how many products are just the same but packaged differently! I keep an eye out for Clinique bonus time – often the free gift comes with travel sized mascara, eyeshadow/blush and facial moisturiser. So handy! I’m not really a BB cream fan, so for my next trip (3 weeks, hoping to fly carry on only!) I’m planning to take a powder foundation which can be used really lightly, like powder, but can also be layered to act as foundation, or even concealer. My entire travel bag is Clinique gifts: cleanser, toner, moisturizer, eye cream, SPF 25,face cream, mascara. The only full size product I take is my favourite deodorant. Those little bottles of moisturizer are perfect! And they surprisingly last ages. I have been obsessing over my travel toiletry list pretty hard lately, so am loving this post. Just picked up some Dr Bronner Castille soap yesterday as my new multi-purpose product! Any advice on how to make the most of solid perfume? I have a L’Occitane one and my housemate has a bunch of Aroamas which I’ve borrowed, and I love the concept but have found the scent to be weaker on application and fade faster than liquid perfume. I would love to find a way around this in my quest to ditch liquids in my bag! Hi Courtney- Unfortunately there is no real getting around the perfume thing. Solids are generally going to be softer in fragrance and the lasting effect varies depending on your skin and body chemistry. Ah well – it’s not like they’re hard to throw in a day bag to reapply. Thanks 🙂 and thanks for your blog, it’s a treasure trove! If you are normally a no-fuss kind of person but have a special event to attend, it can be worth going to a hairdresser for a wash and blow dry, even make-up to avoid having to pack a ton of stuff that’s only going to be used once. Also, for me, I’d rather leave the job to the experts 🙂 I’m so hopeless with stuff like that. I’m preparing for a two week ride on a motorcycle with my boyfriend. I have to pack everything in a single saddle bag. I will tint my lashes and brows (no need for mascara, brow pencil or makeup remover) and use my blush to also highlight my eyelids. Plus a small lipstick and I’m set! I’m a product junkie but have found a great portable solution to not being without what makes me happy. Urban Decay makes a great “on the go” palette with eye lip mascara and eye pencil all in one secure square package. It’s seriously the bomb. Other brands have similar travel,kits. I’m not one to want to do without so this is a great compromise from packing *all* the things! I really like traveling with a multi-purpose oil (I like jojoba, but it’s different for everyone). I have very dry skin, and it’s nice to have something to moisturize face, body, and hair with just a few drops. I also love the pinterest-y gels in a contact case tip — it’s perfect for things you only need a bit of, like acne cream and petroleum jelly or Waxelene (a non-petroleum alternative). One great item that I will be taking is Shea butter ( Evan Healy makes a terrific whipped one)but I will just use straight. It will be face wash, moisturizer for body and face – and hair balm. I have curly hair- so I will be keeping an eye on the weather so I know what type of hair gel to bring. 1 small cont of hair conditioner. And 1 small dr. Bronners for everything else- toothpaste, body wash, laundry detergent, shaving. If I can get a small bottle of rose water when I arrive I’m all set! I like to use my Ultralight Hygiene Kit (from Delta Gear Inc) to carry exactly a few days’ worth of toiletries. Anything I need after that for a trip lasting a week can be bought at a store on the road. As far as makeup, I make sure i have SPF (non toxic organic) and lip balm. When I’ve traveled with carry on only during overseas trips, I took a number of different lip pencils, and just one lip gloss. I changed the color of the lip pencil to change my look and added the lip gloss on top. It saved a lot of space! I use empty contact lense cases to carry my concealer, gel eyeliner, cream eyeshadow (Mac paint pot), and cream blush. I smush the stick into the container or use a q-tip/clean popsicle stick to scoop out the gel liner. This saves a ton of space in my makeup bag! Don’t forget the dry shampoo! They have little containers of the powder type that will help you pack less liquid and then you can skip more hair wash days!! I almost never wear makeup except for dancing or special occasions, so I long ago depanned my solitary eyeshadow palette. I put the two or three eye shadows I need in a tiny tin with a thin sheet of magnet underneath. I use it so rarely that it’s minimal enough for me! Sure, I could buy custom options. But my skin is super picky, so I try to avoid experimenting! Plus, I would just be trashing more products, and I try to minimize waste. By the way, many small makeup company sell samples of their products in tiny baggies or mini jars. Also great for travel, especially if it’s a short trip or you rarely use makeup.